Review of “Hail, Caesar!”: The Coen brothers make a charming but loosely threaded comedy set in 1951 Hollywood. Rating: 3 stars out of 4. Then there’s Frances McDormand as an ultraefficient film editor who swiftly recovers from near-suffocation when her scarf gets caught in the editing machine (“I shouldn’t wear scahves,” is her breezy rejoinder). And Channing Tatum as a smooth song-and-dance man, leading an ensemble of tap-dancing sailors in a scene that I could have happily watched all night. (Hiding within Magic Mike, apparently, was Gene Kelly.) Tying it all together is Josh Brolin as Eddie Mannix, a “fixer” for Capitol Pictures, who spends his day looking decisively at his watch while racing from one crisis to another. All this sounds like a dream for movie audiences and Coen fans, right? Almost. The individual bits of “Hail, Caesar!” are such fun that it’s easy to overlook that it doesn’t quite add up — the movie, though brief, seems to run out of energy before its end. So many of the performances are barely more than cameos; you wish Johansson and McDormand in particular, along with a blink-and-you’ll-miss-him Jonah Hill, had more to do. And Mannix, though sturdily played by Brolin, proves less compelling than those who flit around him. ‘Hail, Caesar!,’ with George Clooney, Josh Brolin, Alden Ehrenreich, Ralph Fiennes, Jonah Hill, Scarlett Johansson, Frances McDormand, Tilda Swinton, Channing Tatum. Written and directed by Joel and Ethan Coen. 100 minutes. Rated PG-13 for some suggestive content and smoking. Several theaters. But I’ll forgive just about anything from a movie that refers to a stand-in named “Chunk Mulligan,” or allows its characters to have genuinely surprising (and funny) secrets, or includes a song with the lyric: “But mermaids (pronounced ‘moimaids’) got no gams,” or that lets Roger Deakins’ camera linger on Tatum, leaning on a piano key, singing with all the wide-eyed yearning of any Golden Age star-in-the-making. 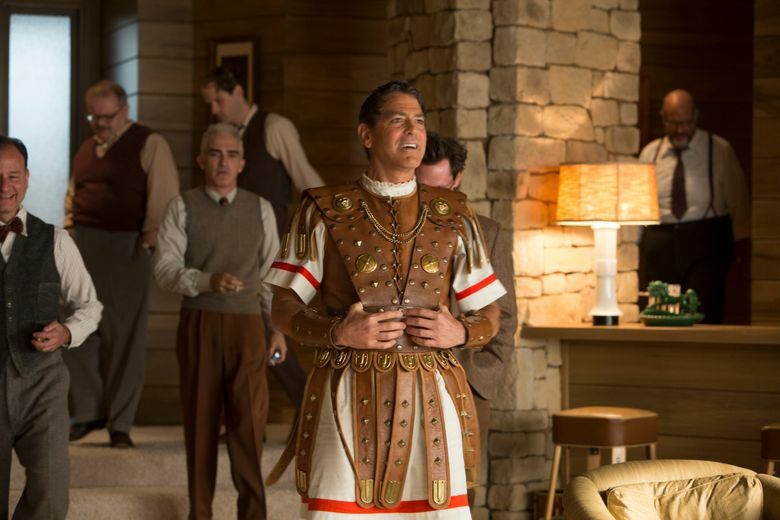 “Hail, Caesar!” isn’t the great film you might like it to be, but it’s very, very good fun.